"Their music is beautiful, really beautiful - and they write it all themselves!" 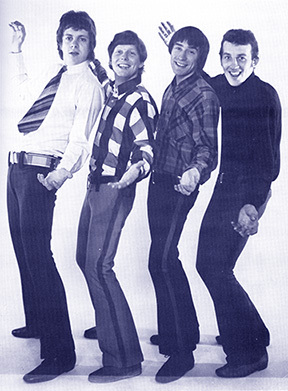 With the departure of Roy Wood and Mike Sheridan in 1966, The Nightriders (see Mike Sheridan and The Nightriders) remaining members Dave Pritchard, Greg Masters and Roger Spencer enlisted guitarist John Mann from the recently disbanded Carl Wayne and The Vikings and secured a recording contract with Polydor Records. Some songs were recorded in London by the new line-up but shortly after, John Mann decided to leave. An advert for a replacement was placed in the Birmingham Evening Mail for a "Keen young guitarist" and this was answered by an almost unknown Jeffrey Lynne who was 19 at the time. Jeff Lynne had formed his first band called The Andicaps with school friends at Shard End in 1963. By 1965 he was playing guitar with a semi-pro local group called The Chads but was always looking for a chance to "turn professional" and go full-time with an established band. The Nightriders were impressed by Jeff Lynne's innovative guitar technique so did not hesitate to offer him the position of lead guitarist. The band soon got together at Hollick & Taylor Studios in Handsworth to record a new single titled 'It's Only The Dog/My Friend' that was issued by Polydor Records under the name "The Nightriders". The single's A-side featured drummer Roger Spencer on vocal while the B-side had Dave Pritchard singing the lead. Although the 45 didn't chart, it's highly valued today as the first official release to have Jeff Lynne who played guitar on the recordings. In 1967, many innovative bands in the U.K. would become part of the rapidly developing so-called "psychedelic" scene. In response to these changing trends, The Nightriders became 'The Idle Race' (adapted from Idyll Race) with Jeff Lynne becoming the groups' focal point as both main songwriter and lead vocalist. Unfortunately, the band's Polydor contract was allowed to expire but former Nightrider Roy Wood, now of the very successful Move, remained friendly with the group and through him, contacts were established allowing the Idle Race to record during off-hours at the Move's Advision Studios in London. 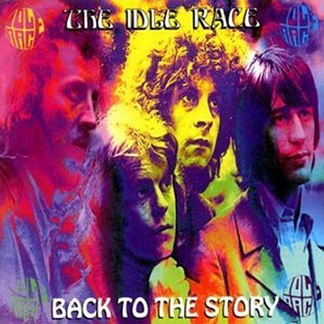 The Idle Race continued to undertake bookings in the Midlands area and would drive down the M1 to London and record whenever studio time was available. One song offered to them was 'Here We Go Round The Lemon Tree', composed by Roy Wood and was the B-side to the Move's 'Flowers In The Rain' hit single. The song was selected as the first Idle Race release by the management of Liberty Records who had signed the group, but as the Move's version was receiving airplay, The Idle Race did not wish to be known as a "cover band" so subsequent negotiations resulted in the Idle Race version of Here We Go Round The Lemon Tree not being issued in Britain. The real reason may have been because The Move stood to lose royalties on the song due to the outcome of the infamous "Harold Wilson lawsuit". It's interesting to note that the B-side to the Idle Race Lemon Tree single was a track titled 'My Father's Son' written by Dave Pritchard. Jeff's compositions were ultimately favoured for most of their future recordings. Dave said; "Jeff was a few years younger than us and we thought we'd project everything on him and make him the front man." Greg Masters agreed saying; "Jeff picked things up very quickly - good singer and harmonizer. We were very lucky. He was another 'Woody' really." For the first U.K. Idle Race single, two Jeff Lynne compositions titled 'Impostors Of Life's Magazine' backed with 'Sitting In My Tree', were recorded and selected for release in October of 1967. Despite airplay, the single did not chart but attracted much interest in the music press and won the group many admirers. Jeff's excitement of having his own songs issued on a single soon turned to dismay when he discovered the incorrect spelling printed on the label for composing credits which read (G. Lynn) !! The Idle Race went down to the BBC studios in London to record their first of several broadcast sessions there under direction of radio veteran Bernie Andrews. Jeff Lynne recalled; "We lived and played in Birmingham so going down to London to record for the BBC was a major event. I thought it was great. You got to record and got paid for doing it. I think the fee just about covered the petrol from Birmingham." Jeff went on to say; "Bernie got us a good sound. At the time I was wanting to be a producer myself so I was learning a lot. I even got some blue corduroy trousers just like Bernie's and wore them for my first attempt at record producer on the second Idle Race album. From then on, corduroy trousers were always called producers trousers!" The third Idle Race single A and B-sides 'The Skeleton And The Roundabout/Knocking Nails Into My House', both Jeff Lynne originals, was issued early in 1968 to promote the forthcoming Idle Race album. Although this single is probably their best known, it also missed out on a chart placing. Note: the Wolverhampton band Ambrose Slade recorded a cover of Knocking Nails Into My House as a track on their first album. Despite lack of success in the charts, the Idle Race gained a considerable "underground" following including the support of many prominent musicians and radio personalities. This is reflected on the inside gatefold artwork of their first album issued in October and titled The Birthday Party where invited "guests" are displayed in a photo collage. The faces include such stars as Buddy Holly, The Beatles, The Move, Steve Winwood, Brian Jones, Hughie Green, and many of the BBC Radio DJs. The album's outside cover artwork had the group members posed around an "invitation" to the imaginary party. "Eddy was a tremendous engineer. He used to cut up bits of tape with a razor blade and swap them around or run them backwards"
Eleven of the thirteen songs on the Birthday Party LP were composed by Jeff Lynne with most of the lyrics having a simple, almost child-like preoccupation with weird characters along with a production reminiscent of The Beatles 'Lucy In The Sky With Diamonds' or 'Fool On The Hill'. Marc Bolan of the group 'Tyrannosaurus Rex' was quoted at the time as saying; "Their music is beautiful, really beautiful - and they write it all themselves!" All these early Idle Race records were recorded at Advision on four-track equipment and produced by Eddy Offord and Gerald Chevin. Eddy would go on to much success in the 1970s producing million-selling records by YES and Emerson Lake & Palmer. Jeff Lynne, already quite an expert at home-recording, watched Eddy and Gerald with more than casual interest and obviously learned a lot from this studio experience. Dave Pritchard recalled; "Eddy was a tremendous engineer. He used to cut up bits of tape with a razor blade and swap them around or run them backwards, or cut them into different sections of tape. Eddie and Gerald used to spend hours in the studio trying to discover certain sounds, like the Beatles were using at the time." 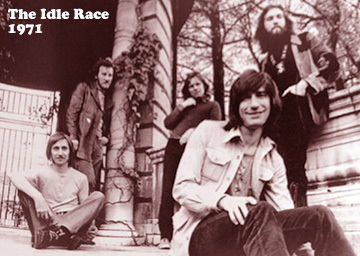 The Idle Race's live performances saw the band in a much heavier vein and included many covers such as 'Purple Haze' (Jimi Hendrix), 'Born To Be Wild' (Steppenwolf) and 'People Are Strange' (The Doors). The band also did a heavy version of Tyrannosaurus Rex's 'Deborah' amongst various originals and 1950s rock 'n' roll standards. 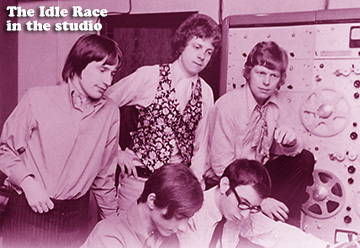 In early 1969 the Idle Race began recording songs for a second album. During this time, Roy Wood made an offer to Jeff Lynne to join The Move to replace Trevor Burton. Lynne declined so Rick Price from the Brum band Sight and Sound was selected as Burton's replacement. It should be noted that Jeff Lynne and Roy Wood were mutual admirers of each others work. Significantly, the first demo recording of the Move's Number One hit record 'Blackberry Way' had been produced in Jeff's home studio. The second Idle Race album was recorded in London at the new Trident Studios equipped with more advanced 8-track equipment. Also recording there was Marc Bolan who would sometimes drop by to observe. Greg Masters remembered; "Marc got quite friendly at one stage. He used to come along at three in the morning and sit in the corner. He never used to say much but he liked Jeff's songs." Two more excellent Idle Race singles were released but despite extensive touring of the U.K. to promote them, the group could still not manage a chart placing. 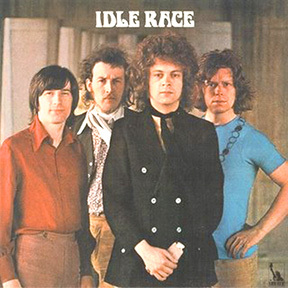 The lack of chart success for the Idle Race despite critical acclaim remains a mystery, especially as the band were no strangers to radio and TV appearances. Even the appointment of DJ Kenny Everett as honourary fan club president and the added flattery of having their compositions covered by other artists did not achieve the popularity the group aspired to. Ironically, the Idle Race enjoyed a more serious "underground" following unlike The Move who by this time were considered by some to be little more than a pop or cabaret act. A high-profile gig for the Idle Race occurred in August 1969, when they performed at the three day highly-rated Plumpton National Jazz and Blues festival. 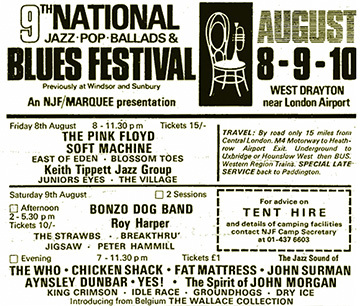 On the same bill were The Who, Fat Mattress, Yes, The Bonzo Dog Band, Roy Harper, King Crimson, and The Strawbs. West Midlands groups Chicken Shack and Breakthru were also included. "We would look at the bands we'd worked with and gone down as well as and think Christ, what are we doing wrong?" Dave Pritchard said; "We would look at the bands we'd worked with and gone down as well as and think "Christ, what are we doing wrong?" We had a lot of people saying "Yeah, it's great, tremendous" but we just couldn't crack a hit record." A music press article on the Idle Race in 1969 quoted Jeff Lynne as being "disillusioned" about the band's lack of chart success. This was further reinforced by poor sales of the Idle Race's underrated second self-titled album released in November on which Lynne himself had handled the production. For Jeff Lynne, fate played into his hands when The Move's front-man Carl Wayne quit the group in January 1970 following a nasty incident on-stage. Roy Wood again asked Jeff to join the Move and this time the offer was accepted (see The Move). The remaining members of Idle Race were naturally disappointed with Lynne's decision to leave but decided to carry on with replacements Mike Hopkins, formerly of the Diplomats and The Lemon Tree, on guitar/vocals and Dave Walker from The Redcaps on vocals & harmonica. Idle Race continued to tour and release singles with their cover version of Mungo Jerry's 'In The Summertime' managing to reach Number One in the charts in Argentina! After a final Idle Race album issued in 1971, further personnel changes took place starting with the departure of Dave Pritchard who joined up with various Birmingham bands including "The Poorboys". Dave Walker was next to leave and joined some well-known bands which included Savoy Brown, Chicken Shack, and Fleetwood Mac. Roger Spencer joined the Brum cabaret band Sight and Sound before moving into TV production and became the comedian "Ollie" Spencer while Mike Hopkins joined the Brum hard rock group "Bandy Legs" who later became Quartz after signing to Don Arden's JET records label. The remaining original Idle Race member Greg Masters was joined by guitarists Dave Caroll and Bob Wilson from the Birmingham group Tea & Symphony along with drummer Bob Lamb who had also played in the group Locomotive. Birmingham singer Steve Gibbons (see The Uglys) joined shortly after and in February 1972, Greg Masters finally left to be replaced by Bob Griffin who in return was replaced by former Move and Balls member Trevor Burton. The group dropped the Idle Race name and became "The Steve Gibbons Band" who scored a top-20 hit with the Chuck Berry song 'Tulane' in 1977. An excellent double CD compilation of all the official Idle Race recordings titled 'Back To The Story' is available for purchase. This CD includes all three Idle Race LPs remastered recordings along with all the original Idle Race singles A and B-sides. The collection also includes three previously unreleased Idle Race tracks. Re-issued in 2007 by Parlophone Records (0946 3 85304 2), this double CD set is very reasonably priced and highly recommended for fans of Idle Race, Jeff Lynne, ELO, and all those interested in 1960s BrumBeat era recordings. Order from your local record shop or purchase on-line.